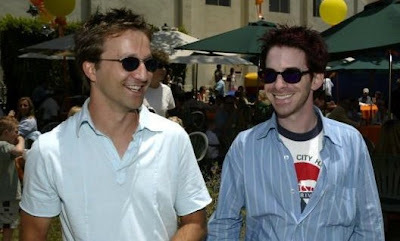 Seth Green and Matt Senreich, the creators of Robot Chicken, visited Blue Sky not too long ago. It was a treat to hear their story and how they achieved every guys dream of getting paid to play with action figures. 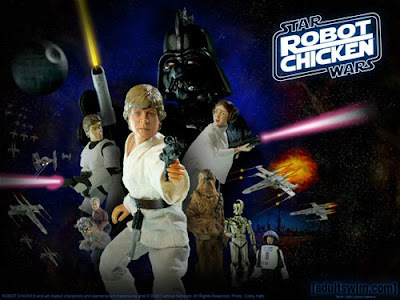 They brought along with them the soon to air, second Robot Chicken-Star Wars episode. They must have read my mind, because there are more crazy good Boba Fett sequences. After their presentation they toured the studio for a bit. Unfortunately, I was unable to snag a pic with them. I was really bummed about it, but they did walk right by me, and I was like, "Hey there's Seth and Matt! You guys make me laugh... a lot! Can we be friends?" That was all in my head, but had I said it out loud I bet they both would have been like, "Heck yes man! That's really why we came to Blue Sky anyway!" Yea... I felt a connection with them in that brief 2 seconds when they passed by. Stay tuned... I'll post an update when my decoder ring arrives in the mail and I figure out what Seth is trying to say to me. Brian Henson, son of Jim Henson, and Co-CEO of the Jim Henson Company paid a visit to Blue Sky today. Brian gave a presentation on the history of the company as well as the Jim Henson style of puppeteering. Brian showed up in disguise (image above) which confused me at first. Eventually, when he felt it was safe to do so, he removed his disguise. Immediately after the presentation, Pete Paquette (an animator at Blue Sky) pulled an imaginary finger gun on him. The crowd thought Pete was trying to mug the unsuspecting Brian, but after Pete was maulled, and cuffed by the muppet police, he explained he was merely trying to shoot the guy behind Brian, who was obviously planning to choke him with an extension chord. Pete's sharp eyes and quick thinking almost saved Brian from a most unfavorable situation. Unfortunately, Pete couldn't finish his heroics, being at the bottom of a five foot pile of muppets. Not all was lost... I acrobatically and gracefully disarmed the would be villain. Afterwards, I was awarded the muppet medal of honor. Of course Brian was very pleased with me, and offered to give me a job as his personal body guard. I, being recently unemployed by my very own muppet creation, jumped at the opportunity. Unfortunately, somebody from Blue Sky's HR department realized I no longer worked there, and had me whisked off the premises before I could accept Brian's generous offer. 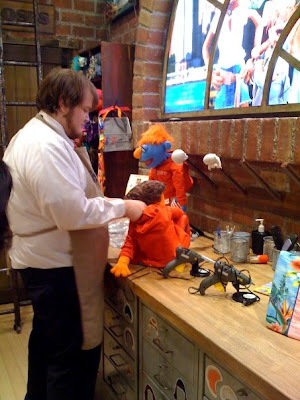 This past Monday I took a trip into the Big Apple to pay a visit to the brand new Muppet WhatNot Workshop inside the amazing FAO Schwartz toy store. It was my first trip into the city, so I felt it necessary to go with friends, and to pack a nerf gun for protection. You can't be too safe... you just never know when a desperate toy, at the end of his pull string, may try something. The journey to the store was long and treacherous, but finally we arrived at our destination without any casualties. 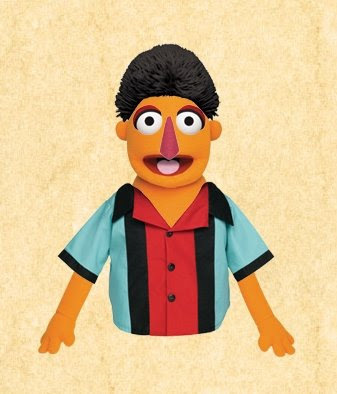 I took the design I created on the website (image above) and jumped into translating it onto the Muppet order form. The mad muppet scientist collected the appropriate body parts to assemble my creation. As you can see below, the scientist had his hands full with several other whatnots to be. I slipped him a 10,000 monopoly dollar bill, and he impaled the poor muppets ahead of mine and got busy with the Tonymation Muppet Creation. It didn't take long before my very own Muppet WhatNot was ready to go home with me. I had to brief him on the exit stragety, and, since I was fresh out of nerf guns, he grabbed a black stick and promptly jammed it into his wrist. 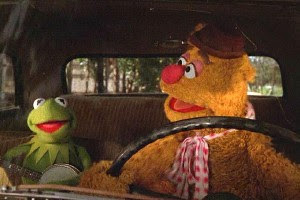 Immediately I knew two things... my new muppet friend was not only tough, but also completely insane. Both are good assets when in New York City. We made it to the train, and were soon on our way back to White Plains. My young and naive friends celebrated, but as you can see in my expression below, I knew we weren't in the clear yet. I underestimated his ambitious nature. By the end of the day, he took my job. Ken Duncan visited the studio this past Friday and shared some of his animation expertise with the staff. He covered the fundamentals of great animation, some of his work, and his workflow in CG. Ken spending time with some lingering animators after his talk. Ken was cool enough to have dinner with several animators afterwards.I am a huge fan of Disney animation from the 90's. It was a real treat to be able to hear stories from one of the talented artists that brought some of my favorite characters to life. I was geeking out most of the night. You can see what Ken has been up to lately by going to the Duncan Studio website. He also has a three part podcast at the Animation Podcast here. Thanks for an sharing with us Ken! Our baby girl was due on Friday, September 5th, and almost on cue my wife went into labor that morning. The day passed with mostly slow and uneventful labor. At the end of the night the real labor kicked in, and finally, early Saturday morning, Kyra was born. She missed her due date by less than half an hour. We had princess Kyra at home. It was our first home birth, since her big brother was born in a hospital. Having her at home was a great experience. We were definitely more comfortable, and you can't ask for a more convenient location. We found that her chord was wrapped around her neck as she came out, which is what probably delayed the labor. Regardless of that complication, she maintained a strong heartbeat throughout the labor and delivery, and was ready for a meal immediately. Our experienced midwives handled the situation very well, and made sure that Kyra was comfortable and free from any danger the entire way through. Welcome to the family Kyra! Today I accepted an contract animation position over at Blue Sky Studios. I will be working on their up coming film, Ice Age 3. This is a very exciting change for the Tonymation family. In fact, princess Tonymation has yet to be born, but she is kicking with anticipation. When asked what she thought about the opportunity for her dad to work on such a fun project she said, "thump, thump... hiccup." That says it all. 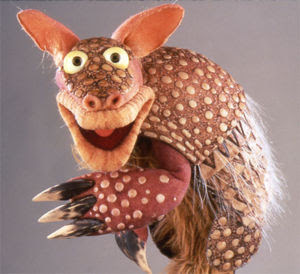 Princess Tonymation will be born any day now, I will finish up my work for Reel FX on the Madagascar 2 promos, and then pack up and head North. Life is fast and furious for the Tonymation family, but we're enjoying the ride. So I just finished doing some work over at the ever growing Reel FX Creative Studios. I was able to be part of two projects during the last few months. I was brought on to help kick out the promo spots for Kung Fu Panda, and I ended up also joining the fight on Open Season 2, as well as the Kung Fu Panda short that will be on the DVD. I had a great time working with their extremely talented team, as well as flexing my tiny animation muscle, which sorely needed a workout. Hopefully the studio will get in their next big project soon, so I can join the ranks once again. I grew up enjoying Disney animated films. They captured a magical world and created a new art form. As I grew older, the Disney films kept me young. It was the magic that the animation team at Disney created, that inspired me to become an animator myself. 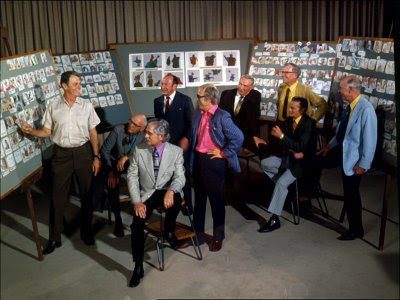 Today we lost a legend that pioneered the frontiers of animation along side eight other artists that Walt referred to as his "nine old men". These men as a team created beautiful films that I still enjoy today with my family. 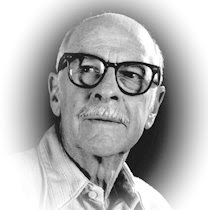 Ollie as an individual created a legacy at the Disney company by not only bringing loveable characters to life on the big screen for all of us to enjoy, but by sharing his passion and knowledge of animation with the next generation of animators. He passed the torch in order to keep the flame of animation brightly burning. Ollie worked on many films we all know, and I thought it would be appropriate to mention them here in order to get an idea of how much he contributed to the industry. Ollie also worked on over a dozen short films, several television shows, he co-authored five books, and contributed to five others. His accomplishments are far too numerous to list on a humbe blog. Today we lost a legend, an icon, and a great man. He will be greatly missed by his loved ones, and always remembered and adored by his fans. It was a fun year in Austin. I started with Midway last March and in April I will be moving back up to Dallas to join some old friends at Reel FX Studios. Leaving Midway and Austin will not be easy. I will miss the people at the studio, and the house we have been renting. I will also miss being able to avoid highway driving on my daily commute. However, it appears a new chapter is waiting to be written in the Tonymation family. Mrs Tonymation is preggers right now, and we will be seeking out a new midwife in Dallas and saying goodbye to our current midwife. We are both sad about this, but life comes at you fast, and we are experienced adventurers ready to plunge ahead. This move is a bitter sweet one. We will be moving closer to family, which, in our case, is a good thing. But we will be leaving some good friends behind. We will be closer to Mama's Pizza, which I am especially excited about, but we'll be leaving Double Dave's Pizza. We will be leaving our comfy 4 bedroom rented-house, but we'll be searching the market to buy a new home. We will be leaving a steady and stable job along with the benefits, that most find comforting , for a short contract job that will be full of adventure. All in all it will be a swift and polar change for us. We feel the change will be a good one.